BEIJING/TAIPEI—China urged the United States on March 21 not to allow Taiwan President Tsai Ing-wen to stop over in Hawaii next week when she makes a tour of the island’s diplomatic allies in the Pacific. Tsai said she will transit Hawaii on her way home from an eight-day visit to Palau, Nauru and the Marshall Islands, which began on Thursday. Tsai’s tour comes amid heightened tension between Taipei and Beijing, which has stepped up diplomatic and military pressure to assert its sovereignty over self-governed Taiwan. Taipei is battling to prevent its remaining 17 allies from switching allegiance to China, almost all small, less developed nations in Central America and the Pacific, such as Belize and Nauru. 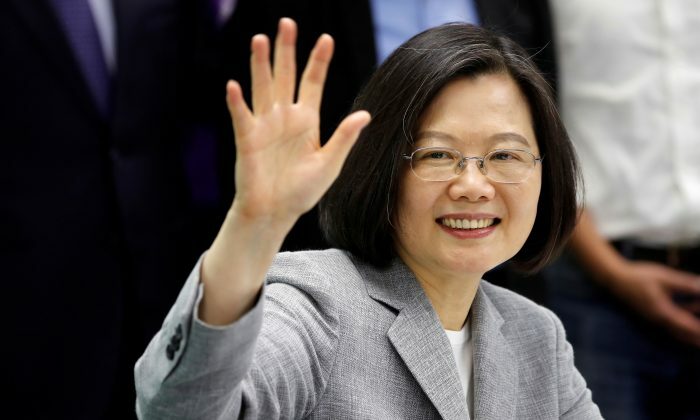 Tsai said in a statement before setting off on the tour that it was her duty to promote Taiwan internationally. “Letting the country advance down the right path, and letting Taiwan continue to shine on the world stage, are all things that must be done as president, and I will go all out,” she said. Taipei has accused Beijing of offering generous aid and loan packages to lure its allies away. Last year, China persuaded the Dominican Republic, Burkina Faso and El Salvador to forge relations with Beijing in what Tsai called “increasingly out of control” behavior. Chinese foreign ministry spokesman Geng Shuang said China had lodged “stern representations” over Tsai’s planned stopover in the United States. “We have consistently and resolutely opposed the United States or other countries which have diplomatic relations with China arranging this kind of transit,” Geng told reporters in Beijing. China views Taiwan as merely a wayward province, with no right to state-to-state relations. The United States, like most other countries, has no formal diplomatic relations with Taiwan but is the island’s largest weapons supplier and most powerful international backer. China and the United States are trying to end a bitter trade war and they also have differences over Chinese activity in the disputed South China Sea, as well as over human rights. Chinese leader Xi Jinping said in January Beijing reserved the right to use force to bring Taiwan under its control but will strive to achieve peaceful “reunification,” though democratic Taiwan has shown no interest in being run by Beijing. China’s hostility to Taiwan has grown since Tsai’s election in 2016 as Beijing fears she wishes to push for the island’s formal independence. Tsai says she wants to maintain the status quo, but will defend Taiwan’s democracy. On March 11, Tsai called a national security meeting, during which she urged the administration to counter Xi’s “one country, two systems” proposal that Beijing uses to push for “reunification” with Taiwan. Tsai called on government officials to come up with measures to “counter” China’s renewed efforts to “interfere” and to “absorb” Taiwan’s capital and talents. “The Beijing authorities continue to utilize our open and free system of democracy to interfere with Taiwan’s political, economic and social developments, which has become the biggest risk in Taiwan,” Tsai said in a statement.